Hiromi Uehara’s tenth album showcases the virtuosic pianist’s formidable technique and range. She has a wild energy, an eclectic compositional talent, a strong left hand and a gymnastic right hand that sparkles with melodic lyricism. 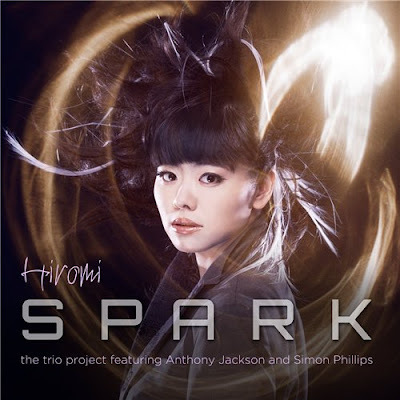 Spark is the fourth album she has made in her Trio Project with contrabass guitarist Anthony Jackson and drummer Simon Phillips. The group is a slick, tightly-arrayed unit, supremely confident and relaxed. They shift between rhythms and tempos with such facility it can be intimidating, but they abound with passion and feeling. Hiromi has a penchant for bluesy tinged licks and boogie-woogie figures that leaven the group’s core angular jazz fusion. Simon Phillips’s drumming, even at its most multidextrous, can sometimes languish teasingly behind the pulse, bringing the swing. Six-string bass pioneer Anthony Jackson is a virtuosic player, but is always locked into the direction of the ensemble. Spark continues precisely where 2014’s Alive (link to review below) left off. If anything it’s more exciting, though nothing on Spark is quite as fearsome as that album’s title track, nor as instant as Seeker. They can really fire off a lot of notes, as on the skittish In a trance and the juddering Dilemma. They know when and how to strip it down to a simple groove; the languorously melodic Indulgence has the feel of nineties R&B jams. The tender Wake Up And Dream recalls the ballads of the American songbook while Hiromi’s expanded harmonic language brings a contemporary edginess. The nine tracks are listed with little existential descriptions like “Living in the very moment,” “Should you step ahead or backward?” and “Dream for a new beginning” intended to document Hiromi’s personal journey. The album suggests she’s been keeping her eyes and ears open along the way. At seventy-five minutes it’s a journey for the listener too, but a diverse and engaging one — a masterclass in exciting and dynamic trio playing.